SunseekerDoors are a UK based manufacturer, designer and installer of innovative door systems. Their website is used at the forefront of their marketing strategy. Therefore we had to ensure that the new website and SEO campaign would increase their number of leads even further. 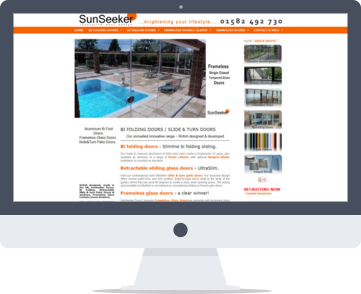 SunseekerDoors are a UK based manufacturer, designer and installer of innovative door systems. Their website is used at the forefront of their marketing strategy. Therefore we had to ensure that the new website and SEO campaign would increase their number of leads even further. With several months of design amends to increase usability and conversion rates, along with an aggressive SEO campaign, they now receive over 250 unique visitors per day.